In a small bowl, whisk together the egg, flours, milk, olive oil, baking powder and salt. Add in the herbs and cheese, if using, and stir to combine. Pour the batter into a small microwave safe bowl or wide mug and microwave for 90 seconds. Place the mug or bowl upside down on a cutting board or plate and let the bread slide out. 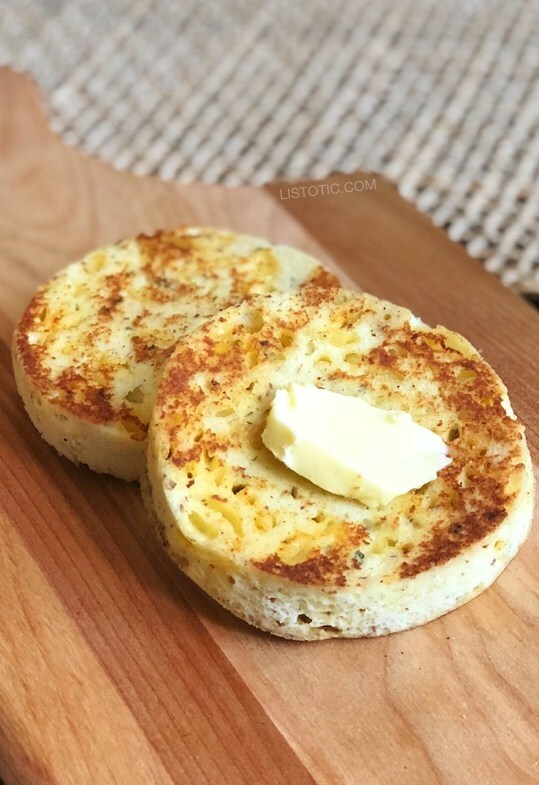 Cut it crosswise making two round english muffin shaped biscuits. To toast, place the bread rounds on a high heat skillet with a touch of butter or oil for 30-60 seconds on each side. The combination of the coconut flour and almond flour give this biscuit just the right amount of structure and moisture. If you are using just coconut flour, I would only use 1.5 tbsps. If you are using just almond flour, you will probably need 3-4 tbsps. This multi purpose bread can be eaten as toast or sandwich bread! It’s absolutely delicious with a fried egg, a few slices of bacon, cheese and avocado piled on in between.